Audi CEO Rupert Stadler says plug-in hybrids such as the A3 e-tron could account for as much as 40% of the automaker's global sales by 2020. Not long ago Germany's vaunted auto engineers were accused of being behind the times for stubbornly clinging to their old-fashioned diesels while Toyota was held up as a technology leader and savior of the environment because of its revolutionary Prius hybrid. Today, Volkswagen, Audi, Porsche, BMW and Mercedes are embracing plug-in hybrids as "the best of both worlds." Models such as the Audi A3 Sportback e-tron, BMW i8 and Porsche Panamera S E-Hybrid allow drivers to commute emissions-free to work during the week without stopping them from heading to the Alps on the weekend because the downsized combustion engine under the hood eliminates the range anxiety that has hindered the purchase of full-electric cars. A plug-in's electric motor delivers maximum torque instantly, which means there is no sacrifice of performance. Carmakers also benefit because plug-ins are given preferential treatment by regulators when it comes to determining the car’s so-called “certified” CO2 emissions. “Future mobility must be environmentally friendly and conserve resources. Our answer to this challenge is the plug-in hybrid technology -- for us the best synthesis of sportiness and sustainability,” Porsche CEO Matthias Mueller told journalists at the Paris auto show in October, adding that his carmaker is the first in the world with three plug-in hybrids (the 918 as well as variants of the Panamera and Cayenne). 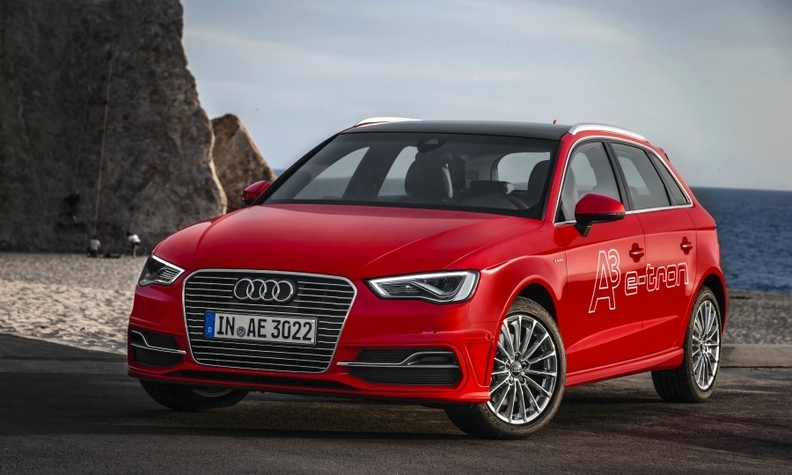 Audi CEO Rupert Stadler says the A3 e-tron won’t be his company’s only plug-in for long. “We will add a new model each year, beginning with the Q7 next year, followed by the A6 long-wheelbase sedan for China and the A8,” Stadler told Automotive News Europe. 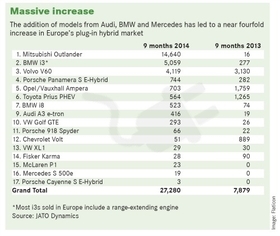 Currently 10 out of the 17 plug-in hybrids on sale in Europe have a German brand’s logo on the hood. The three big German premium brands have all identified plug-ins as a strategic priority heading toward 2025, which is when even tougher EU CO2 emissions regulations may take effect. “Plug-in hybrids could account for 10 percent to 20 percent, even 40 percent of the 2 million units we plan to build annually by 2020. It will be our customers who decide, and we are ready to satisfy their demand,” Stadler said. BMW Chief Financial Officer Friedrich Eichiner recently told London-based investment advisers Evercore ISI that “more significant volume is expected from plug-in hybrids” than from full-electric vehicles. Analysts agree. “By 2015 or 2016, we will actually see an inflection point where global plug-in hybrid production overtakes that of electric vehicles,” said Ben Scott, senior analyst at IHS Automotive. His market research firm estimates global plug-in hybrid production will amount to 1.35 million in 2020. Five years later output is expected to double to 2.7 million, but this still would only account for 2 percent of all light vehicles manufactured around the world. While the future looks promising, volumes for plug-in hybrids are still in the hundreds and thousands, not tens of thousands because they face many of the same problems hindering the uptake of full-electric cars, specifically their high cost, the lack of a charging infrastructure and declining fuel prices. While automakers are benefiting from government incentives, they are also taking dramatic steps of their own to showcase their commitment to lowering emissions. An example of this is Daimler’s choice of Copenhagen, this year’s environmental capital of Europe, for the launch of its greenest Mercedes-Benz S class ever – the S 500e plug-in hybrid. Zipping through Copenhagen’s fashionable downtown district, the 5-meter long Mercedes flagship emits less CO2 than a fuel-powered Smart ForTwo microcar: just 65 grams per kilometer to be precise, at least according to the New European Driving Cycle. Instead of a thirsty V-8, the S 500e uses an 8.7 kilowatt-hour lithium ion battery that has enough power to chauffeur VIPs 33km before a downsized six-cylinder combustion engine kicks in to increase range. In theory, the S 500e’s fuel tank might not ever end up being used, even though the car’s consumption is certified at 2.8 liters per 100km. Mercedes product planning and strategy head Johannes Reifenrath said the S class would form the vanguard in a new automaker’s fleet of low-emission dual powerplant cars. By 2017, Mercedes aims to have launched at least 10 new models with plug-in hybrid powertrains. “The New European Driving Cycle favors plug-in hybrids,” said Reifenrath, explaining that the 33km electric range allows Mercedes to knock off 56 percent from the 149g/km of CO2 its combustion engine emits, according to a curve. “The aim of the legislation is clear and we fully support it: [Getting] as many electrified vehicles as possible on European roads.” Mercedes rival BMW is getting ready to add plug-in hybrid versions of the X5, 7 series and the long wheelbase version of the 5 series as electrification becomes a key factor in reducing CO2 output from it fleet. Despite being named European Car of the Year in 2012, the Opel Ampera has been a commercial flop. This might be just enough to help make it more mainstream. Studies have shown that for an innovation to gain mass-market appeal, it needs to reach a critical threshold of about 16 percent of potential customers. Only then will a tipping point be reached where a majority less comfortable with change slowly but surely is willing to try out a new product or technology because enough early adopters already have – a phenomenon known as the law of diffusion of innovation. Although Jaguar Land Rover won the 2011 Award for Automotive Innovation from the UK’s Society of Motor Manufacturers and Traders for its Range_e plug-in diesel-electric hybrid concept, it has not announced any concrete plans with specific plug-in models. Volvo, meanwhile, beat its German rivals to market in Europe with the 2012 launch of the V60 plug-in variant. The boss of the Swedish automaker, which will add an XC90 plug-in hybrid version in Europe and the U.S. next summer, is committed to the technology. “This is the path we will pursue and I believe it is absolutely the right concept because range always will be a drawback with full-electric cars,” Volvo CEO Hakan Samuelsson said. 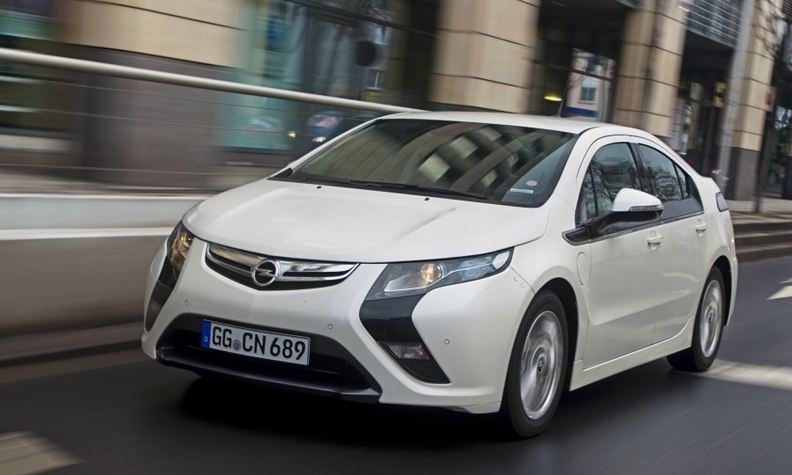 Apart from premium manufacturers, however, investments to roll out new plug-in and electric vehicle technology largely has been pushed back by most volume carmakers following the commercial failure of Opel’s award-winning Ampera. Profit margins are already razor thin in the volume segment after the European car market shrank by a quarter since its 2007 peak. Betting that consumers would pay a steep premium to drive a fully or partially electrified powertrain in the midst of a prolonged recession is not a risk brands such as PSA/Peugeot-Citroen and Fiat Chrysler Automobiles are willing to take. Currently, plug-ins are even more expensive than full-electric cars because they have two powertrains. A VW Golf GTE plug-in starts at 36,900 euros in Germany, or 2,000 euros more than its e-Golf. BMW i3 customers pay an additional 4,500 euros on top of the 34,950-euro price tag if they want the electric car to have a range-extending engine. Ironically, just when the German government was about to host an international conference on electro-mobility in Berlin in May 2013, charging network start-up and venture capital darling Better Place filed for insolvency after demand for electric cars and plug-ins like the Ampera fell far short of expectations. The bottom line is that Germany’s carmakers are scared. A schizophrenic Europe demands them to maintain stable employment in high-wage countries, provides them no relief for the overcapacity that meeting that demand creates and still expects them to have enough cash to invest billions in zero-emissions technologies with few prospects of a return. Environmental advocates argue that automakers are doing just fine as they are two years ahead of their 2015 CO2 targets. Carmakers counter by saying they have gotten there by using less expensive solutions such as downsizing and turbocharging, neither of which significantly boost prices nor require customers to change their driving habits. That won’t be the case, automakers say, if the EU car fleet CO2 target dips to between 68g/km and 78g/km by 2025 from the 2020 requirement of 95g/km because getting there will be impossible without mass adoption of plug-ins and electric cars. BMW CEO Norbert Reithofer calls the EU’s 2025 proposal a “pure gamble” because it assumes electric cars and plug-in hybrids will emerge by then. He added that Brussels is guilty of creating an industrial policy that is “totally out of balance” with environmental policy. Reithofer doesn’t see electric cars becoming profitable for the next 10 to 15 years, which is a problem when he calculates that were the 2025 target introduced, roughly a quarter of its cars sold in Europe would have to run on electricity. As a result, the BMW CEO already now expects he will have no choice but to increase the share of his European sales coming from Minis, 1 series and 2-series Active Tourers to more that 40 percent from about 35 percent.